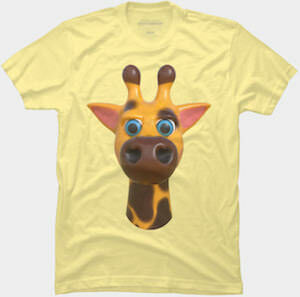 Now you can have a friendly animal on your shirt all thanks to this Giraffe Face T-Shirt. This t-shirt is available in a while bunch of colors and it comes in different shirt styles for both men and women and in sizes going from Small – 5XL. As you can see there is a cute giraffe on the shirt and it seems a bit cartoony and it is staring to the world around you. A fun shirt like this will make people smile around you as it looks so friendly and fun and we can all use a bit of fun in our life and the giraffe can help with that. 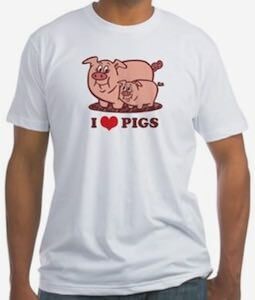 If pigs are on your mind then you should check out this fun I love pigs t-shirt. You can get this cute pig t-shirt in styles for men, women, and kids and it is available in many styles, colors and sizes. On the t-shirt you can see two happy looking pigs and then below it you can see the text “I Love Pigs” and it does not say love but shows a red heart as it is true love. And yes even if your pig love is just because your love of bacon then this is the shirt for you. 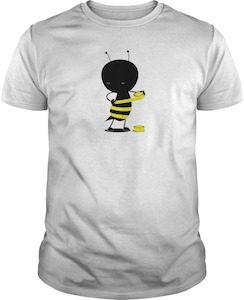 This bee dressing up t-shirt is funny! On the t-shirt you can see a bee and it seems to be completely black but to make it looks like a real bee it is adding some yellow tape that it is wrapping around the bee body so that it starts to look like a real bee. You can get this funny bee t-shirt in men and women’s styles and it comes in many colors and in sizes Small – 5XL. It’s a really funny t-shirt and that is a good reason to ad it you shirt collection and as we know that we have to save the bee this one could be the first one you save. 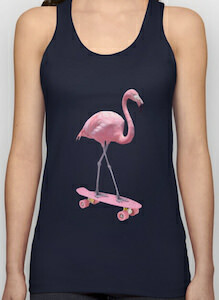 If you like a fun skateboard tank top then this flamingo on a skateboard tank top would be a great piece to own. The tank top is unisex so both men and women can enjoy it and it comes in a bunch of colors like black, blue, white, and gray. On the tank top you can see a flamingo riding a skateboard and as the bird is pink it also picked a pink skateboard because that it is its favorite color. You can get this 100% cotton tank top in sizes XSmall – XL and it would be a big hit in the skatepark or just around town this summer. This panda bear t-shirt is just fun looking and that makes it perfect for anyone that likes pandas and fun shirts. You can get this t-shirt in styles for both men and women and it comes in many fun colors and in sizes Small – 6XL. And the bear on the shirt is black and white but the lines are purple and the white is more like a really light blue and the bear is wearing a green sweater. 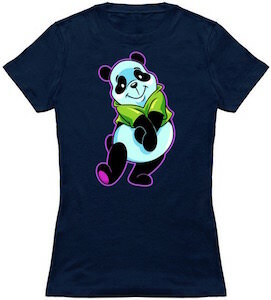 So lots of color for this silly panda and I am sure that you will love this t-shirt and people that see you wear it will too. This t-shirt shows a raccoon looking for free food. If you are also on the look out for free food then wear this t-shirt so that everyone knows who to give food. 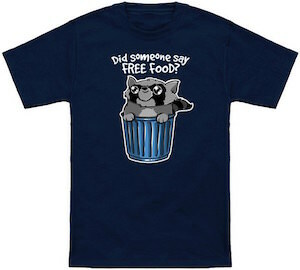 On the t-shirt you can see a garbage bin with a raccoon sticking out and above that your find the text that says “Did Someone Say Free Food?”. 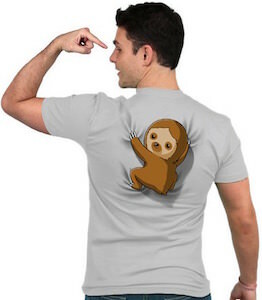 You can get this funny looking t-shirt in men and women’s styles and in sizes Small – 6XL. And all these free food t-shirt’s are made from 100% cotton. Show the world that you like to eat like a raccoon and leftovers will be coming your way. This t-shirt shows a caution sign that shows the image of a shark and some text and that makes it funny if you wear it. You can get t-shirt t-shirt in different colors and styles for men and women and all are made from 100% cotton and are available in sizes Small – 5XL. 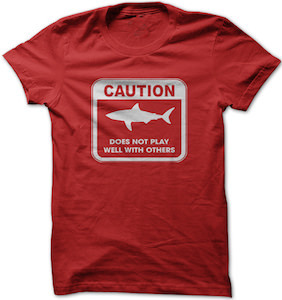 On the shirt it says “Caution shark does not play with others” and we already figured out that sharks are not the most playful kind when they play with humans as the people often seem to loose body parts and that means that sharks play rough. 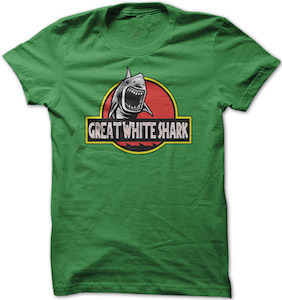 This shark t-shirt is all about big white. On the t-shirt you can find a logo that reminds me of Jurassic Park with a red circle with in it a big shark and a banner on it that says “Great White Shark”. The shark t-shirt is great for Shark Week of course and any other day of the week. You can get this shark t-shirt in men and women’s styles in sizes going from Small all the way to 3XL and all shirts are made from 100% cotton and are available in many fun colors to. Something just need to be done slow and that is why this t-shirt shows a snail for those days when you just want to take things at a slower pace. 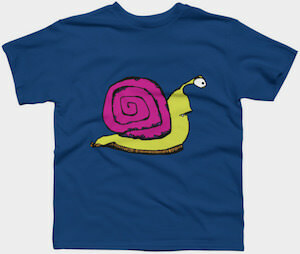 You can get this snail t-shirt in many colors and in sizes for men, women and kids. Just a t-shirt with a snail on it is fun and you can even give one to your friends as a fun gift that makes them wonder if you think they are slow. It’s just a t-shirt with a colorful snail with big stickup eyes to stare ahead.